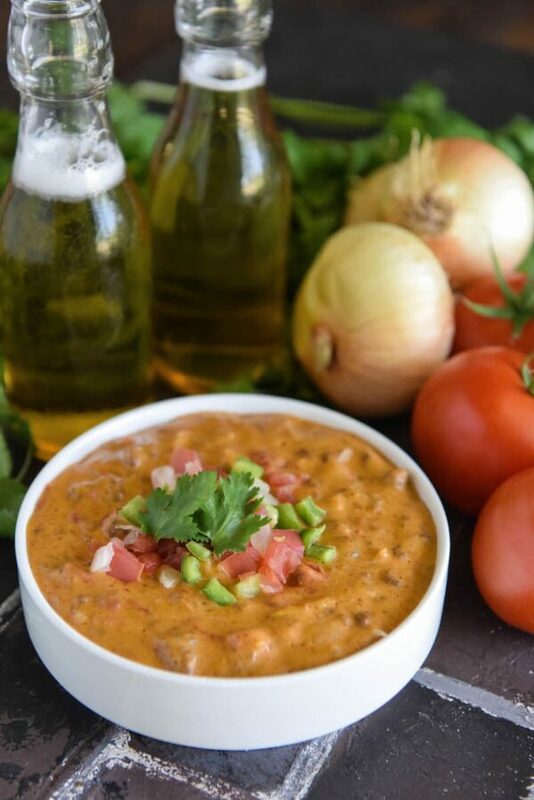 Cheesy Taco Beer Dip: sharp cheddar cheese, ground beef, McCormick taco seasoning and a Mexican beer combine to make this delicious dip that is perfect for Cinco De Mayo! Break out the tequila and limes, it’s almost time to celebrate Cinco de Mayo with some great Mexican inspired dishes! Cinco De Mayo has always been one of my favorite holidays. Growing up in Texas, it was always celebrated extravagantly. 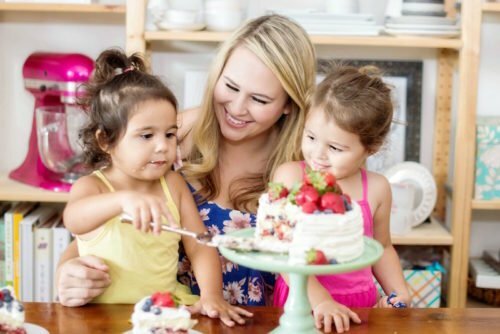 This year, I plan on making the holiday fun by using McCormick to make this family-friendly party a real fiesta! 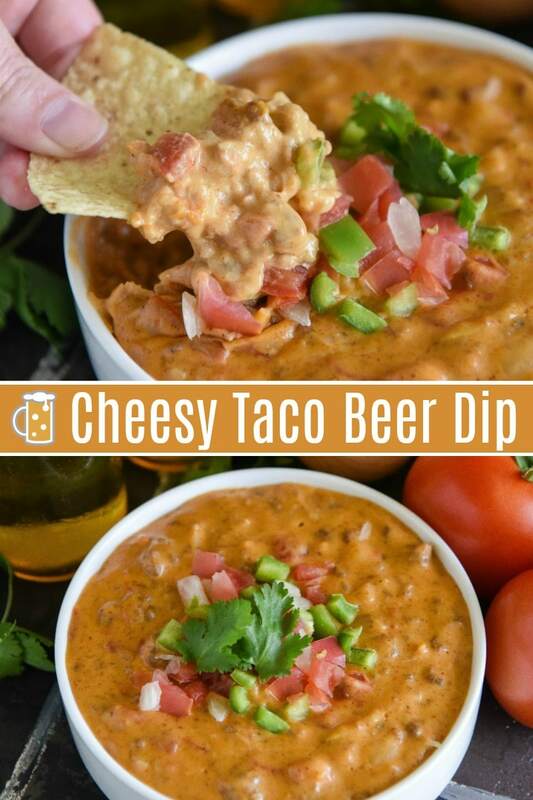 I am so in love with this Cheesy Taco Beer Dip and I can’t stop eating it on top of everything! With tortilla chips, on top of burritos and yesterday Jorge even put it on top of a hot dog. It’s just SO good that I could even eat it with a big spoon! 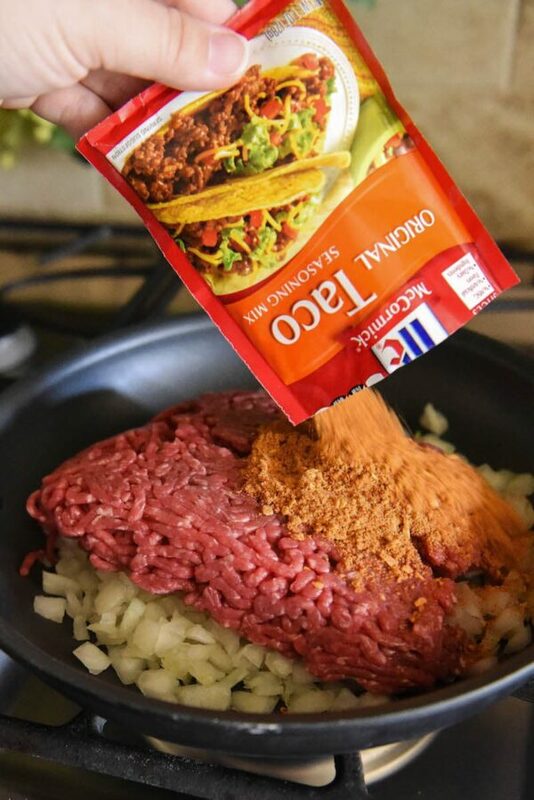 You start with ground beef, yellow onion, McCormick Taco Seasoning. 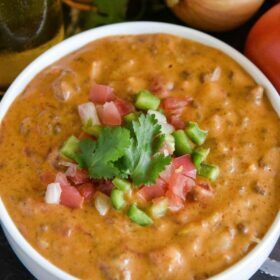 Then we add in lots of good Mexican beer, diced tomatoes, green chilies, cream cheese and sharp cheddar cheese. I like to thicken my Cheesy Taco Beer Dip with a few tablespoons of cornstarch. 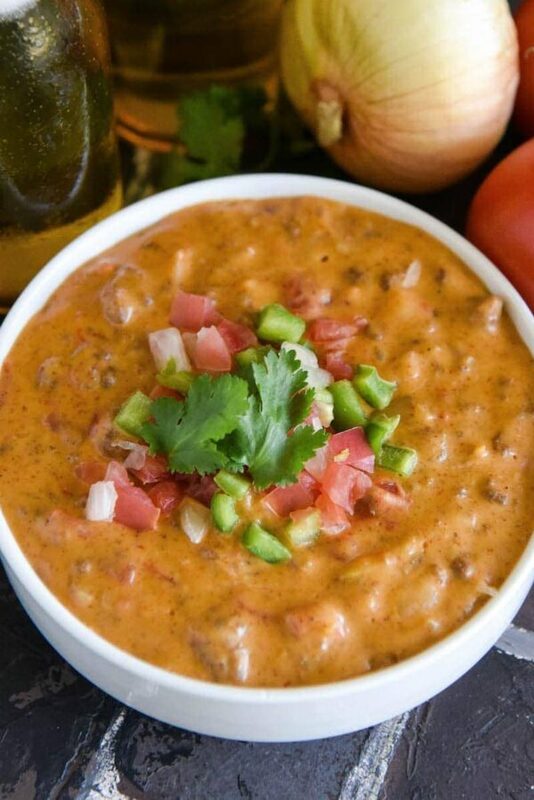 It creates the perfect cheese dip texture. 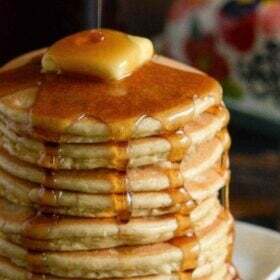 However, if you would like it to be lower in carbs, you can use a teaspoon or two of xanthan gum instead. 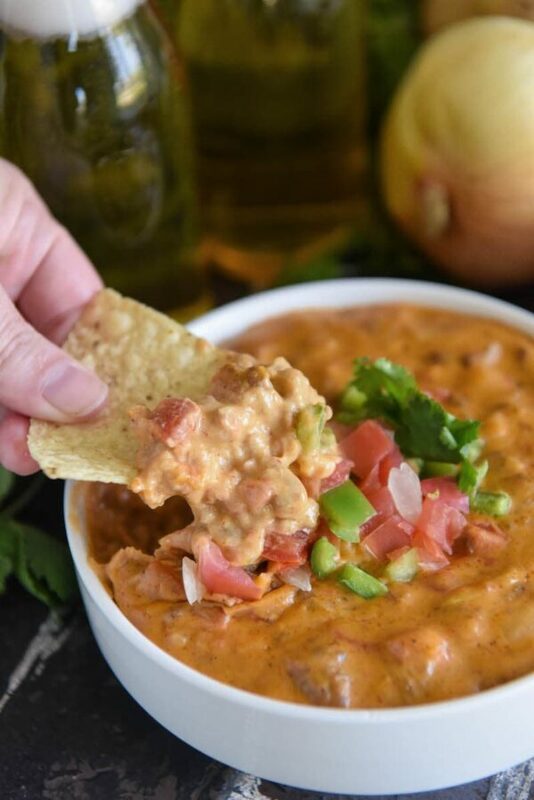 I use McCormick Taco Seasoning to load my dip with tons of flavor from one little easy packet (great for busy moms or home cooks of any level!). McCormick Taco Seasoning is a zesty blend of authentic Mexican seasonings that turn ordinary food into a fiesta of flavor. It includes some of my favorite seasoning like onions, peppers, garlic, chili pepper and paprika! You can also swap it for a packet of McCormick Cheesy Taco Seasoning to up the cheesy factor with the same amount of great spice as the original. 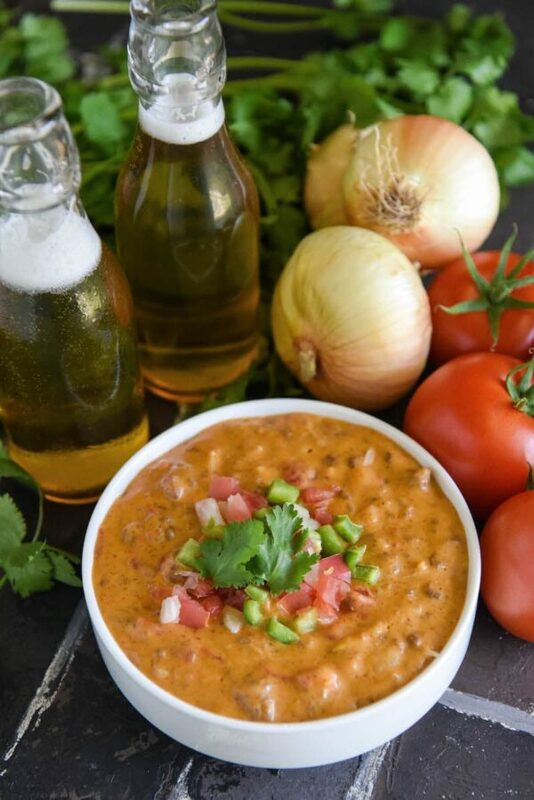 While this Cheesy Taco Beer Dip is easy to make, you can save a lot of time and make it ahead of your party. You can keep it warm in a crockpot, set on the warm setting, for up to 8 hours. Just remember to give it a stir every so often. If it gets a little thick, add a tablespoon or two of milk or beer and stir! 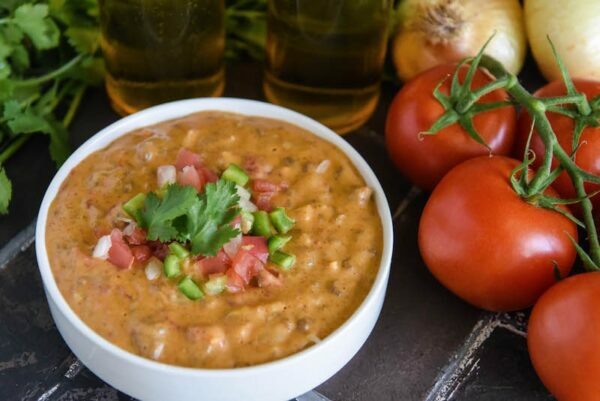 I know you are going to enjoy this extra flavorful Cheesy Taco Beer Dip as much as we do! For other Cinco de Mayo favorites – like Mexican Street Corn and Cheesy Taco Empanadas check out McCormick’s website. Add ground sirloin, taco seasoning and onion to a large heavy bottomed pot over medium high heat. Break apart with a wooden spoon and cook until meat is browned and onion is translucent. (You should not have much grease if using ground sirloin, but if there is a lot after the meat is browned, drain off any excess.) Add can of diced tomatoes & green chilies. Add cornstarch and stir until well combined. Slowly add beer and milk, while consistently stirring. Add cream cheese and cook, stirring often, until melted completely. Then add cheddar cheese and stir until melted and well combined. 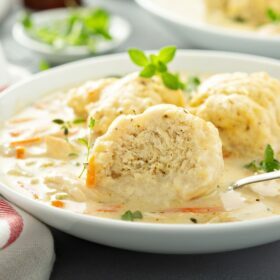 Serve immediately or keep warm in a crockpot on the warm setting for up to 8 hours. 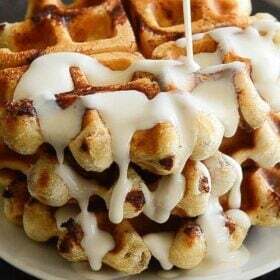 YUM, this looks amazing!! 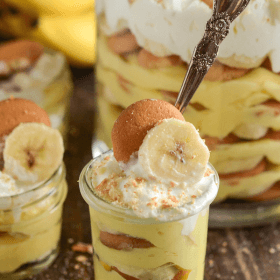 Will be bringing this to my next get-together! This is so perfect for any Cinco de Mayo party! This looks amazing! I could just eat it all and make it my dinner!! I love that you used sirloin for this dip! I bet the flavor is outstanding! Ohhh I’m going to need about 2 huge bowls of chips and I’m gonna plow right through alllll of this dip. It looks SO amazing! I can’t wait to try this! Looks perfect for parties! 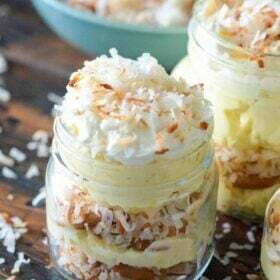 I could eat this by the spoonful!! pinning!! 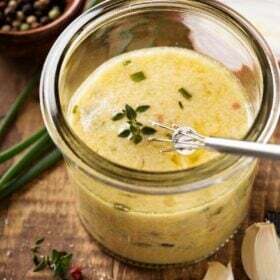 yemmi and mouth watering recipe…..
Wow, this dish looks delicious to me.